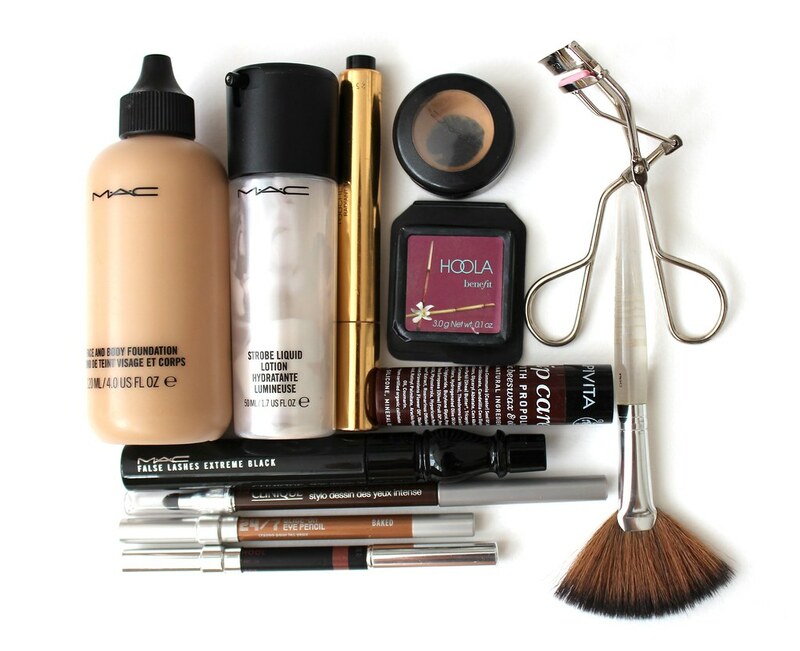 B U B B L E G A R M: Everyday Makeup Staples! 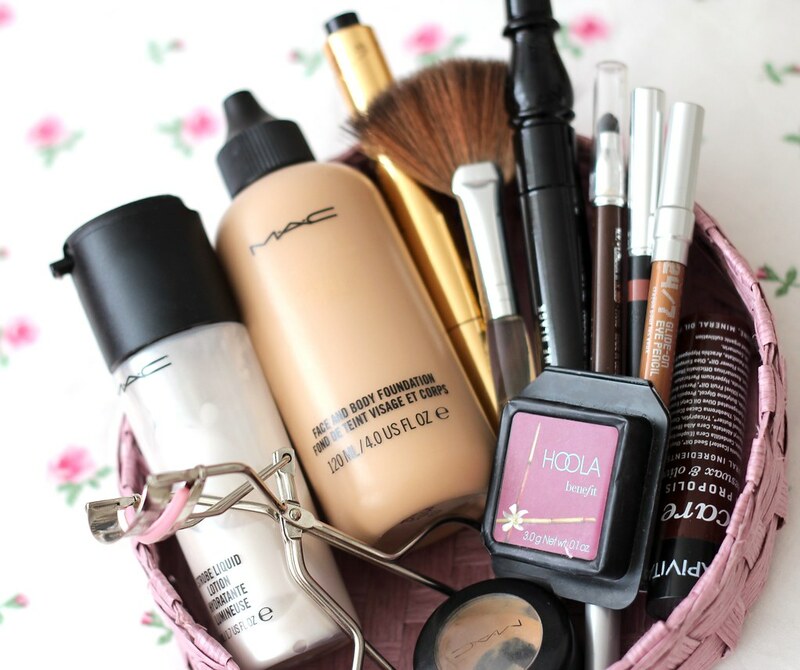 There are a handful of makeup products I can't live without, and I will repurchase over and over again. I don't wear makeup everyday but when I do it's usually a soft natural look, however evening makeup is another story. I mix Mac 'Face & Body' foundation (Full Review HERE) with Mac 'Strobe liquid' in the palm of my hand, about half of each and apply directly to my face with my fingers. This creates a luminous sheer finish which I LOVE. I use Mac 'Studio finish concealer' in NC30 to pinpoint conceal, I have a couple of scars that need coverage. I curl my lashes with the Shue Uemura curlers. I apply Clinique '03 intense chocolate' brown eyeliner on the upper lash line and smudge & wing it out with the applicator on the other end. I also tight line and apply liner to the waterline but only on the inner and outer corners, I find that if i line it all the way it closes up my eyes. I apply Urban Decay 'Baked' 24/7 eyeliner on the lower lash line slightly smudging it into the brown which compliments my eye colour. I contour/bronze with Benefit 'Hoola' (Full Review HERE) focusing under my cheekbones with the 'trish McEvoy' fan brush, I also dust it into my crease which balances me out. I apply Jemma Kid lip liner in '02 Nutmeg' which is the exact same shade as my natural lip colour. I then apply lip balm (Apivita is my favourite at the moment) & a tiny dab of concealer on the centre of my lips to mute them out to balance out the eyeliner. I don't always wear eyeliner as it can look heavy and does take some time, usually it's just mascara and lipstick/gloss but this is the exact look I have been rocking lately. And here's me wearing everything stated. I haven't been doing anything to my brows as I have been growing them out since January, luckily they're getting back into shape. Hope you are all well, as an FYI: I have lost 15lbs so if I look a little different it's because my face has slimmed down. :) I will be doing a proper post dedicated to my weight loss quite soon! However, keep up to date on Instagram by following 'OfficialFoodDiary' with my daily food and fitspo photos. Disclaimer: The Clinique eyeliner, Apivita lip balm & Trish McEvoy' brush was sent or given to me at a press event for review purposes a long time ago now :) I wasn't paid to mention any of the products & I'm not affiliated with the brands mentioned. Honest opinion as always. The Apivita lip balms are my favourite too, whenever my lips are cracked I slap them on and the problem is solved! I think the Clinique Intense eyeliners are one of the best out there, they're true to their name- INTENSE!!! 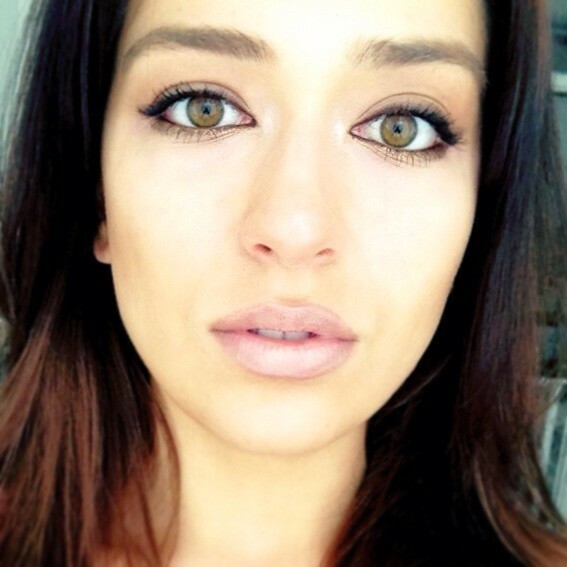 I haven't seen a more rich and pigmented eyeliner in the market! Love your photos! Muhsine - you are just radiating beauty! You are seriously the poster child for the benefits of healthy eating. I love following your IG food account for all the great meal ideas. 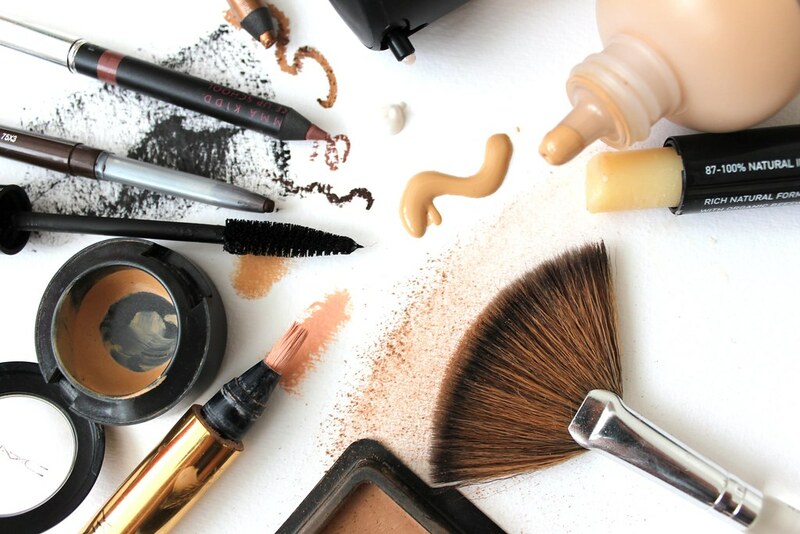 Loved seeing your MU picks - I'm going to try mixing strobe light with my foundation - does it highlight skin imperfections though? So pretty! I am just starting to explore highlighting and contouring...I would love a tutorial if you are willing to share! OMGSH you look gorgeous! and I love your instagram, always gives me great ideas! I also love mixing strobe cream with my foundation! :) you're gorgeous! I love this post. You look gorgeous! Hi that a really nice selection of make up, i love the look of the mac. I like your everyday makeup!!! I love your make up ! You look lush in these pictures! And the photos are gorgeous.